Taizé is my inspiration for singing songs to celebrate the Lord and I am really hoping that writing my own chants will help me express the peace and presence of God that I feel when I sing Taizé music. When I release a CD of chants, you’ll have to let me know what you think! There’s something about chanting which reminds me of something I read recently about ‘slow prayer’. Here’s the extract – “St. Teresa of Ávila recommended this technique to another nun: Pray the Lord’s Prayer, but take an hour to pray it. Spend a few minutes entering into each individual phrase, until it becomes truly the prayer of your heart, and you become the prayer.” I’ve got a lot of time for the contemplative saints and this quote really rings true for me. By chanting you can grow in the words you are singing. They can mean something different to you each time round. They can reach a crescendo and they can be soft. It’s a beautiful experience to sing chants, and that’s why I love Taizé. The simplicity of the words lets you really open yourself up to their meaning. So when I was writing some of these chants earlier I was using the words from various Anglican rosaries, which I discovered just this morning! I hadn’t realised that rosaries had made it into the Anglican tradition but have really enjoyed reading about them today. They’ve been around since the mid-1980s according to this website – http://www.kingofpeace.org/prayerbeads.htm. I have toyed with the idea of setting a whole rosary to music and recording it the right number of times so that it is like singing a rosary. I’d love your thoughts on that one! Chanting is a way to sustain personal prayer. As St. Augustine said, ‘Singing is praying. He who sings prays twice.’ Beautiful! Today I have really felt the unity of these different things – that chanting is a way to pray slowly and thoughtfully, to delve into a relationship with God by using beautiful music to open up the heart and receive the love which God is desperate to share with us all. Here is a chant I’d love to use at some point (I’m working on my Hebrew!) The words are from Hosea 2:18. Video below. I have been thinking about this saying quite a bit over the last 2 days. I would really like to try to put it into practice, but I can imagine people around me being only too happy to criticise me if I fail! Being positive is something I try to do all the time, although I don’t think I’m necessarily predisposed to it. I am often told I smile a lot and people who I rarely speak to will sometimes comment on it. In fact, I’ve had more compliments about smiling than about pretty much anything else throughout my life! The first compliment I ever had was about my smile…I can remember it clearly! Smiling makes a difference…it’s a way to release endorphins (the happy hormone!) which will lift your mood and help you feel happier. A character from the TV programme, Ally McBeal, went to ‘Smile Therapy’ to help him with his problems. I wonder if he was onto something! I don’t know how I managed to come across this video today but I did, and boy am I happy that I did!! It is incredible! I’ve seen a few of these animations before and the ones I’ve seen have all been worthwhile. This one is particularly thought-provoking. There are two things which I found fascinating about this. Firstly, that empathy is integral to human beings. I suppose a lot of it is common sense (especially about babies crying when they hear other babies cry) but it was amazing to hear all the points in one place. I’ve been in situations before where someone has been upset and has been crying, and I’ve found it hard not to cry, too. I’m sure you’ve experienced something similar. What an amazing thing to know that we are all connected through our ability to empathise. I just kept thinking of the number of times I’ve said ‘we are one body’ during Communion services. The other thing I found amazing is that it is possible that Adam and Eve might have existed! I’m not sure on the science behind the claim, and I’m sure that it will be contradicted in many other sources, but what an interesting thought! I’ve always considered myself to be a theistic evolutionist really – after all, why couldn’t God make the world in the way that science says? They’re certainly not mutually exclusive in my mind! If someone managed to prove beyond a shadow of a doubt that all human beings came from one man and one woman, I wonder what change would come over the world!! But for now, here is one of my favourites. It seems very apt for this post! The messages and lessons held within this event are extensive. With this one event, found in both Matthew and Luke, we are taught that God has a plan for each of us, that God’s angels are His messengers on Earth, that God is willing to take birth and incarnate for the salvation of all, that Mary submitted to the will of God regardless of the cost to herself and that all things are possible to God. There seems to be something familiar in this: Mary accepted the role of mother to God incarnate and thereafter was left almost entirely alone (on the surface, anyway! ), and Mother Teresa took up her calling to help the poor of Calcutta and was then left bereft of the presence of God we might assume she felt. The article linked above gives an incredible insight into the suffering Mother Teresa underwent during her lifetime. Is that the same suffering that Mary underwent, particularly during her pregnancy? And most importantly, is it that suffering which we all feel sometimes, regardless of our faith or background? Is the role of Mary and the Annunciation to encourage us to believe even when we feel like we’ve lost all faith? As Martin Luther King Jr. said, ‘Only when it’s dark enough can you see the stars’. Can we learn to rejoice in our doubt as we rejoice in our faith? Surely the despair of a believer who’s lost their faith is testament to unshakable certainty that God is there, holding them in His arms and keeping them safe. If Mary had not taken the leap of faith to carry the Son of God, we may not have known Him. If Mother Teresa had not kept on working to help and heal the poor, we would have lost an icon for Christian goodness and kindness. If we shy away from what we feel God is calling us to do, what will be lose? This is the message that the Annunciation is bringing me this year – that God is there for us whether we recognise it or not. And if we can just learn to become His instrument, we can be everything that He made us to be. This beautiful song is my offering to you on this blessed day. May you meet with God today and feel His arms around you. I have often contemplated on trust, as I’m sure many Christians have. It seems to be a topic which arises particularly when I am struggling in some way – whether that be in understanding my purpose, things not going my way or feeling unsatisfied with some aspect of my life. I can remember being a teenager and people telling me in that patronising voice ‘you’ll get used to it’ or ‘you’ll understand it when you’re older’, or the most frustrating, ‘you’re so young!’ It would drive me mad! Unfortunately they were right (of course) and now, although I’m still only 25, I find myself using the same phrases sometimes. I appreciate every difficult situation I have ever experienced, because I can see precisely how they have prepared me for the roles I fulfil and the tasks I complete in life now. And yet, having this knowledge and understanding the role that suffering has played in my life so far (to a greater or lesser degree), I still find myself resisting and complaining when I am presented with opportunities to grow. I can semi-remember a quote which is about how God answers prayers in the most unexpected ways, and trying to Google it has led me to see testimony upon testimony of people writing about how their prayers have been answered unexpectedly. I know in my heart of hearts that I don’t need to worry. I have had so many personal experiences of God working my own life, of prayers being answered and of situations working out just perfectly, and with hindsight I have developed an understanding of the way that everywhere I end up is helping me to grow in some way. So why is trust so difficult to maintain? I suppose the one consolation is that Jesus understood the weakness of human nature. When he called Peter towards him and Peter doubted, it is almost as if he is consoling him; ‘Oh you of little faith’ as one might comfort a child who has fallen over and grazed their knee. But the beauty of experience and hindsight is that we can piece together the proof of God’s love in our own lives. We can understand how God has worked in our lives in the personal and subtle ways that only we can recognise, leading us to trust in Him again and again. And in that there is a great reassurance. This prayer by Saint Aidan of Lindisfarne is one which often plays on my mind. He is a saint renowned for ‘cultivating peace and love, purity and humility’, and that opening line is definite food for thought. I have lived on my own for 3 years and have grown to really love the solitude and freedom that it gives me. However, I often waste time as I’m sure everyone does. I give myself excuses for why I can’t do certain things or why I will do them later than I should…probably a common confession. But I wonder if there’s a link between the opening line of his prayer, ‘leave me alone with God as much as may be…’ and his qualities. When you’re on your own it’s easy to think that you can do what you want because no one’s watching. I am sure that if the Jesus of biblical times came to stay with me, I would use my time in a very different way! I would keep my house as clean as possible, I would spend as much time with him as I could and I would consider his teachings much more often than I currently do. I would also try to be peaceful, act lovingly towards both other people and animals, and I would try to live with purity and humility as Aidan is believed to have done. Why would I do this with Jesus and not with others? If Jesus feels the least thing that we do for or another, then isn’t that the same thing? But it’s an awful lot harder to remain peaceful around people who you find challenging, or to act out of love towards someone who pushes all your buttons! Maybe by being left alone with God we are given the chance to develop these qualities which we can then put into practice with others. Who knows? But it’s a good prompt for me to start trying to use my time more efficiently at home! Why doesn’t God jump in? I love Mitch Albom. I’ve only read two of his books (Tuesdays with Morrie and Have a Little Faith), but both have been life-changing reading experiences for me. Perhaps the basis of each book (conversations with men who have inspired Albom and who are dying as the story unfolds) strikes a chord, but for whatever reason they are breathtaking. I read this quote again this evening when I was thinking of something to write. A few weeks ago I agreed with a friend that we would send each other a text message with one exciting thing that we did or saw or experienced every day. It was a great experiment and really helped me to be the most positive I could be. Perhaps this blog will do the same – help me to focus on God every single day. That would be great!! So my musing for this evening. It isn’t about free will, which is what Mitch is discussing with the Reb in this extract from Have a Little Faith. It’s about the choices that we make in life. Something which I’ve been thinking about for a long time is our nature: should we try to change the people that we are to become better or more ‘God-like’, or should we embrace who we are because that’s the way we were made? I haven’t yet come to a conclusion on this one, even after several years of thinking about it! I can’t help but think that perhaps it would be nice if God would just jump in and give me the answer! Many of the guidelines in the Bible and in the lives of saints which people may follow can, I think, be condensed into one word: love. It’s an instruction, a state of being, a way of life, a philosophy, a description of God. Love. I want with all my heart to love my neighbour, as Jesus taught. Being human makes that a bit difficult, and probably the thing I struggle with the most. I frequently ask myself: if I can’t love such-and-such, how can I call myself a Christian? And perhaps the answer lies in the saying – you don’t go to God because you’re perfect; you go because you know you’re not perfect. Maybe it’s not that hard to become the people that God made us to be after all? When I first started walking along this path of faith, people would often recommend books to me. I found it really hard to motivate myself to read any of them, always believing that if I was meant to learn something it would happen in my life, and I would learn it first hand. I’m glad to say that I have read and benefited from many books since then, but I do think there is some truth in it. Perhaps it’s all interwoven – to live in love, through love and by love is to connect with God and to fulfil our purpose, and in doing so we can quiet the struggles in our souls. I went to Bristol today on a school trip and had a very interesting conversation with a colleague. She was noticing things which I had ceased to see – the way birds were making their nests, deer in a forest (I was sad I didn’t see that! ), the size of different houses as we drove past…and I was astonished about how unobservant I have become. When I voiced this to her, she told me that this was the first spring she has seen in England for 8 years, having been in Africa with Mercyships. 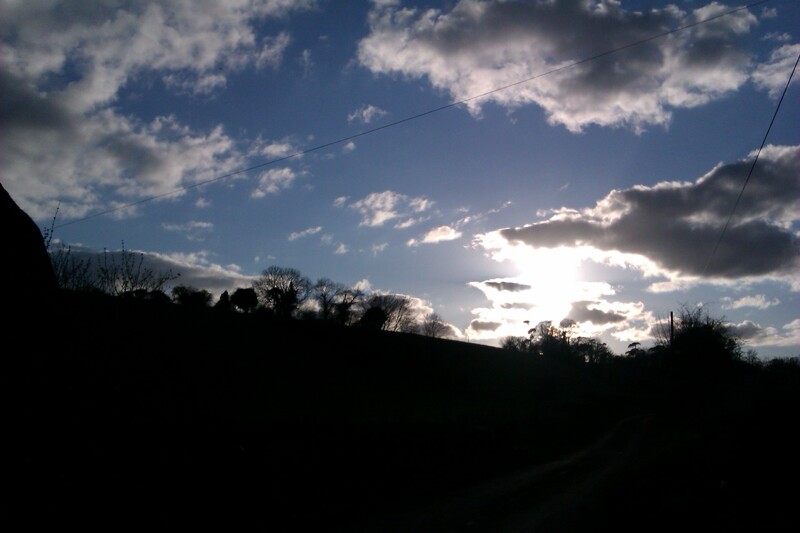 This made me reflect on how much we take for granted, and this evening I went for a long walk in the countryside. I noticed the way that the trees were growing, the way that leaves lie on the ground, the sound that the birds were making and the feeling of being part of this beautiful, incredible creation. I took a photo of the sunset, just to remind me of that feeling. Can we appreciate things every day, in every moment? Or do we need to become numb to them so that we can discover them again in joy? I suppose that is the same question as ‘if there was no suffering, could we enjoy happiness?’ and other variants on that theme. Perhaps we can come to a point where we derive joy from everything we encounter, seeing the presence of God in the world and rejoicing in it. As I was singing at a concert last night I was overcome with a feeling that God was calling me to share not only my music but also my experiences with the world, so here I am, blogging! It all started when I was 17…all those many (8!) years ago! I had visited the Taizé community in France and had experienced such a deep sense of spirituality that I came home burning with a desire to spend my life singing to God with the simplicity and humility that I had seen and felt at Taizé. I have since released two albums of ecumenical music which have aimed to encompass the inclusiveness and reality of the music at Taizé; I also run a monthly Taizé service, I have given concerts, I have sung at weddings and funerals, and even at a festival attended by nearly 10,000 people! However, it’s not just singing that I do to serve God. I am also an RE teacher in a secondary school in Dorset. One thing I really love about teaching is that I spend a lot of my time speaking to young people about things they are struggling with in their lives. This has given me such a great opportunity to connect with people and to learn more about myself as well as about them. By spending time talk to them I have become more aware of God working through me, making them feel valued and cared for.